Dinghy Sailing at Plas Menai National Outdoor Centre SailingFeel the wind in your hair and the breeze on your face as we introduce you to the dynamic sport of sailing. Whether you are looking to sail on your own or with others, sailing offers plenty of variety and excitment. 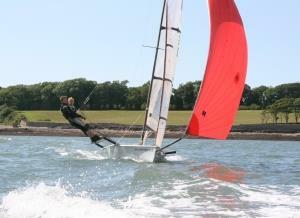 Plas Menai runs a number of five day and weekend sailing courses. For those with little or no experience our five day Learn to Sail course offer a fantastic introduction to the world of sailing. You will begin the week in a double handed dinghy with an instructor onboard. During the week you will also get the chance to sail a single handed dinghies and weather and conditions permitting you may also get ta cahcne to sail our catamarans and keelboats. Feel the wind in your hair and the breeze on your face as we introduce you to the dynamic sport of sailing. Whether you are looking to sail on your own or with others, sailing offers plenty of variety and excitment. The Centre is open all year around however it does close between Christmas and New Year.